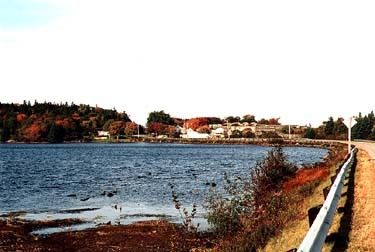 Raynardton is a small area, nestled in between the communities of Deerfield and Tusket Falls . It is attractively set around Lake Vaughan, the roads circling the lake on both sides. Lake Vaughan is a man-made lake, created over 100 years ago by the first settlers. It is now used as a source of electricity for the Nova Scotia Power Company. Swimming is very popular in the summer time, and the lake attracts wildlife such as loons, ducks, beavers, muskrats, and a fairly large fish supply. The area is very beautiful all year round. In the fall the trees are lit up with colors, and in winter it becomes a winter wonderland. The area is also attractive for homes. Many people, young and old, have found the area a good place to raise a family, spend a quiet retirement or expand family roots. Many people have been moving into the area, building new homes or renovating old ones. Aside from new settlers, there are many who are ancestors of the first settlers. The names "Raynard" and "Andrews" still live on, being the most dominant families. There is a sense of family and history in this small community. Raynardton -- It is Reynardton in Bruce Fergusson's 'Place Names and Places of Nova Scotia' and he says that the name comes from "Job Reynard". He does, however, state that "Variations are Rainerton, Raynard's Falls and Reynard Bridge." Gardener's Mill -- This becomes Gardner in the complete listing on the right on the Home page and the map shows "Gardner Mills".